Protests over racism on campus have erupted at colleges nationwide. Students from Massachusetts to Missouri are demanding their schools confront racism of the past by renaming buildings commemorating advocates of slavery and of the present with calls for changes on campus, like university faculty that’s more representative of the student body. 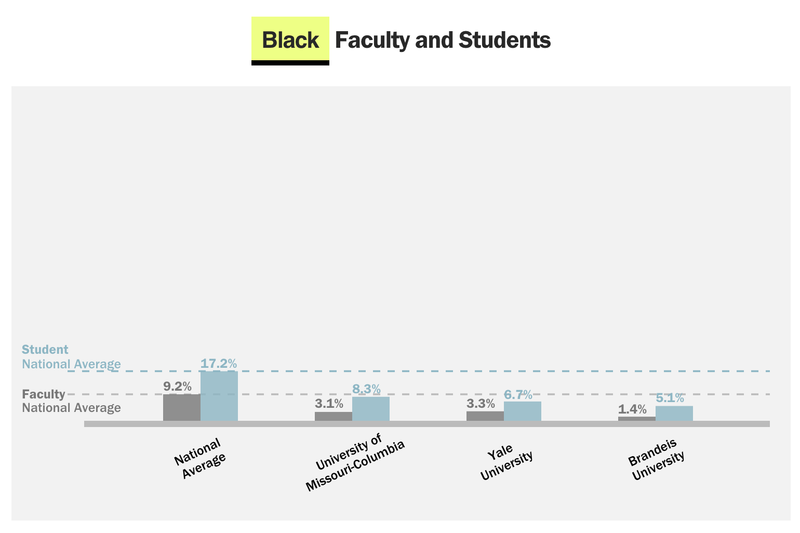 Among degree granting colleges that receive financial aid from the U.S. Department of Education, 17 percent of full-time undergraduate students are black, compared with nine percent of professors. At the same 4,313 schools, 12 percent of students are Hispanic, compared with four percent of faculty. At the same time, the percentage of Asian and white professors outnumber the percentage of students of the same race: five percent of professors are Asian compared to four percent of students. Seventy-six percent of professors are white compared to 54 percent of students. Search for any school that receives federal financial aid in the graph below, and select the dropdown menu to see how schools compare across different racial groups, as recorded by the Department of Education. Data above represents the make-up of full-time undergraduate students and full-time instructional staff at schools that submitted race data, a requirement for receiving financial aid from the federal government, to the National Center for Education Statistics in 2013, the most recent year with complete information on these schools.